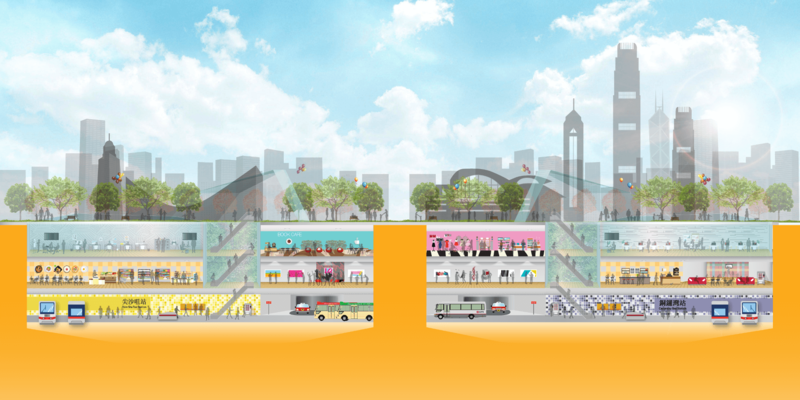 Welcome to the website of the Pilot Study on Underground Space Development in Selected Strategic Urban Areas. In many densely developed urban areas, Hong Kong is experiencing heavy pedestrian and traffic flows leading to a congested street environment. Besides, the densely built environment and limited land resources have limited the scope for further development of the urban areas to satisfy long-term community needs. 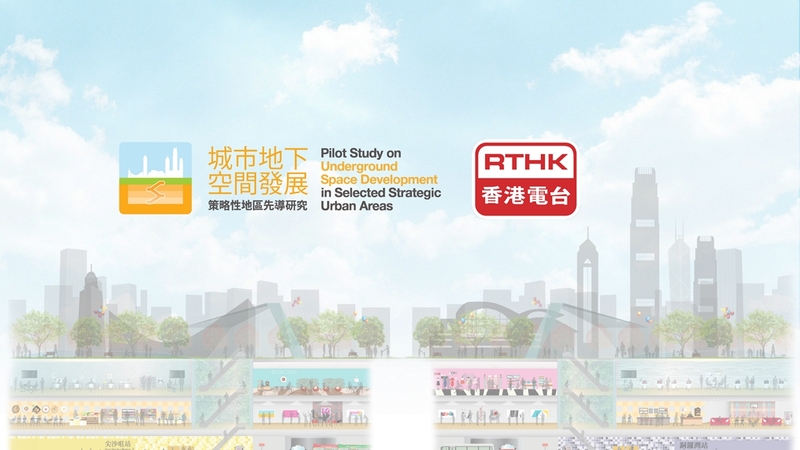 In June 2015, the Government commissioned the “Pilot Study on Underground Space Development in Selected Strategic Urban Areas” covering four selected Strategic Urban Areas (SUAs), namely Tsim Sha Tsui West, Causeway Bay and Happy Valley, and Admiralty/Wan Chai. The Study aims to identify the potential for underground space developments in each of these areas, and to formulate Underground Master Plans to guide the future underground space development. Booklet of Design Ideas Competition is available for download, please click here. The prize presentation ceremony for the Design Ideas Competition was successfully held on 16 August 2018. All entries and the models of winning entries (First Prize, Second Prize and Third Prize) will be showcased in a roving exhibition. Congratulation to all awardees! The result has been announced. A roving exhibition will be held in August to September 2018. Details will be announced in due course. 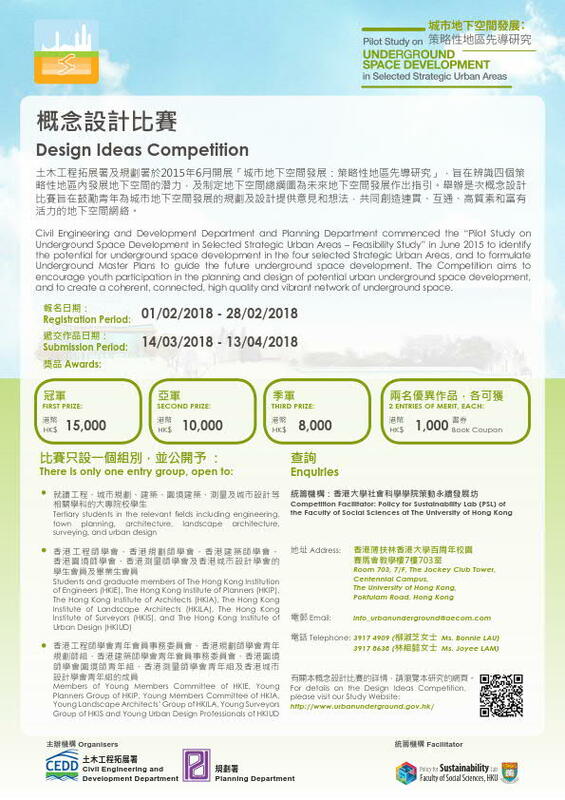 Design Ideas Competition Schedule is updated, please click here for more details. Briefing Session Presentation Material is available for download, please click here. Design Ideas Competition will commence on 01 Feb 2018. Please click here for more details. Please click here for the Article by the Head of Geotechnical Engineering Office, CEDD on Underground Space Development. Thank you for your proactive contributions and valuable comments. The Stage 1 Public Engagement of the Study was ended on 6th February 2017 (Monday). Comments collected are now being incorporated in a report for public reference. Please continue to browse this website for further understanding of the underground space development and the latest updates of the Study. Public Planning Workshop will be held on 2017-01-15, for details, please click here. Public Planning Workshop will be held on 2017-01-08, for details, please click here. Stage 1 Public Engagement Digest is now available on the website. Please download here.